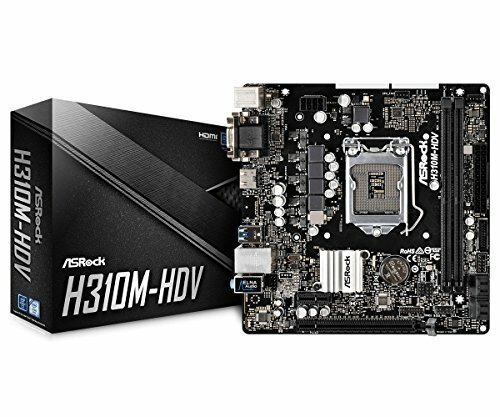 ASRock H310M-HDV LGA1151/Intel H310/DDR4/SATA3&USB3.1/A&GbE/MicroATX Motherboard. Chipset: Intel H310. Memory: 2x DDR4-2666/2400/2133 DIMM Slots, Dual Channel, Non-ECC, Unbuffered, Max Capacity of 32GB. Slots: 1x PCI-Express 3.0 x16 Slot, 1x PCI-Express 2.0 x1 Slot. SATA: 4x SATA3 Ports, Support NCQ, AHCI and Hot Plug Audio: Realtek ALC887 7.1-Channel High Definition Audio CODEC LAN: Realtek RTL8111H PCI-Express x1 Gigabit Ethernet Controller Ports: 4x USB 3.1 Gen1 Ports (2 rear, 2 via header), 6x USB 2.0 Ports (4 rear, 2 via headers), 1x PS/2 Mouse/Keyboard Port, 1x VGA Port, 1x DVI-D Port, 1x HDMI Port, 1x RJ45 LAN Port w/LED, Audio I/O Jacks Power Connector: 1x 24pin ATX Power Connector, 1x 8pin 12.